This section contains Articles, Events, People, Places and Subjects of interest written by him or by other people about him. It is a diverse compilation of topics which give insight into the life and career of this Pioneer in the Multicultural Food Industry in Canada and around the world. There are several links within this Section that lead you to his Biography titled "The Immigrant", his early beginnings, videos and audios in several languages. There is a huge selection of Recipes reflecting local and international cuisines with photos detailing the process in the art of cooking and presentation. You may then link to MR. Goudas Books which portray a wide range of topics. Many are filled with humor. Several of them are translated into other languages. They are all enjoyable, insightful and educational. There is an option to send a Letter to him in the Customer Letter Section. In addition, the link, Appreciation Letters, portrays the endless amount of humanitarian and philanthropic work he has done over the span of his life in helping organizations, associations, communities in need, senior citizens homes, community housing sites (for various ethnic nationalities), charitable organizations, cultural organizations, scholarships events, Philoptochos Society's organizations, orphanage housing. Including contributions to disaster relief all over the world, floods, earthquakes, typhoons, etc. making him a citizen of fourteen countries. The section, FlYERMALL.COM, is an amazing site containing flyers from stores and companies local and international. Within FLYERMALL.COM there is a link called FLYERMALL TUBES which portrays the life stories and achievements of certain personalities, subjects of interest and countries across the globe. These tubes have been created and maintained by him. FLYERMALL.COM is considered to be the first of its kind in flyer advertising and with millions and millions of viewer hits from around the world. The PHOTOS link contains images and upon clicking any of them it leads you to a background story. 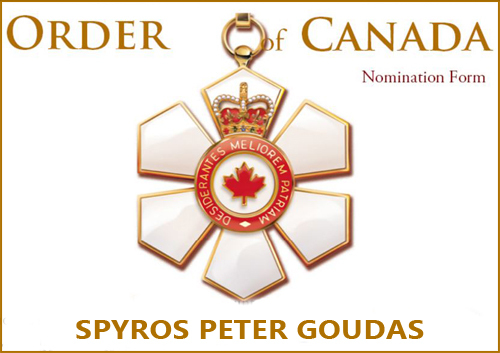 Thank you for visiting Peter Spyros Goudas website, one of the largest and independently owned on the world wide web.